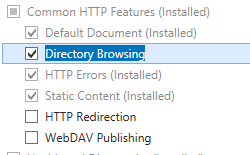 The <directoryBrowse> element controls the information that is displayed in a directory listing when you enable directory browsing for your Web site or application. The <directoryBrowse> element can contain two attributes. The enabled attribute determines whether directory browsing is enabled for the site, application, or directory. The showFlags attribute defines the information about each file in the directory that Internet Information Services (IIS) will display. IIS can display the last modified date and time, the long date for the last modified date, the file size, and the file name extension. You can choose which of these, if any, IIS will display. 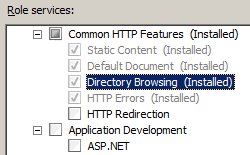 IIS 10.0 The <directoryBrowse> element was not modified in IIS 10.0. 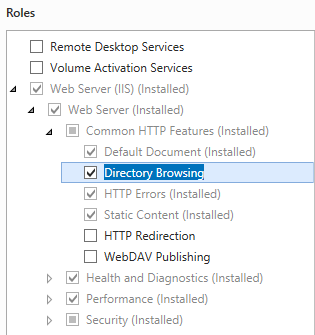 IIS 8.5 The <directoryBrowse> element was not modified in IIS 8.5. 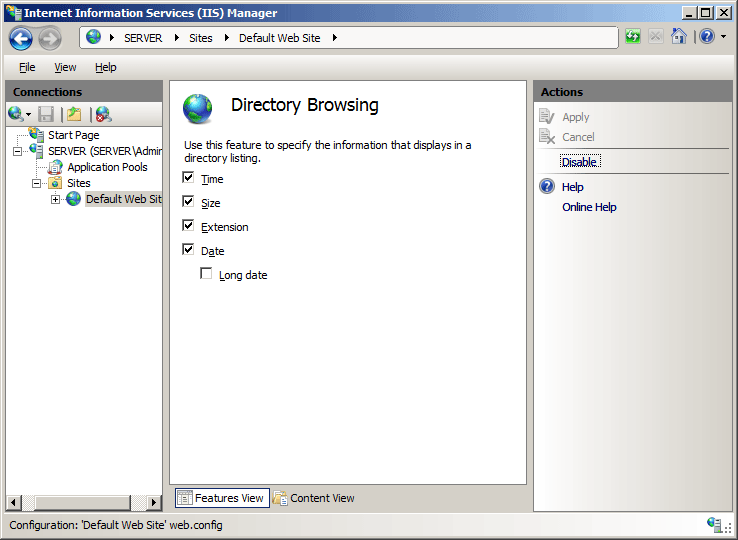 IIS 8.0 The <directoryBrowse> element was not modified in IIS 8.0. 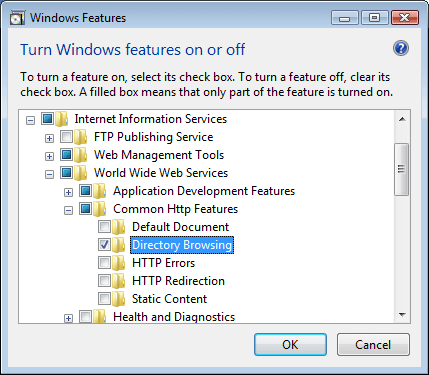 IIS 7.5 The <directoryBrowse> element was not modified in IIS 7.5. 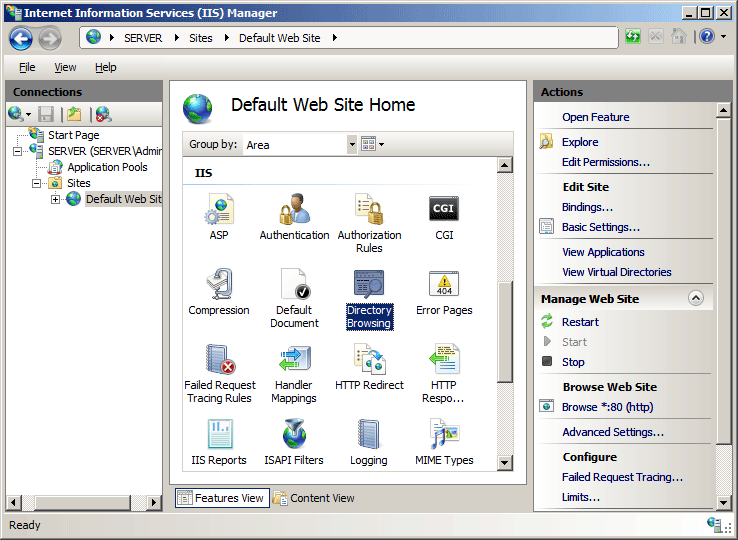 IIS 7.0 The <directoryBrowse> element was introduced in IIS 7.0. IIS 6.0 The <directoryBrowse> element replaces the IIS 6.0 DirBrowseFlags metabase property. 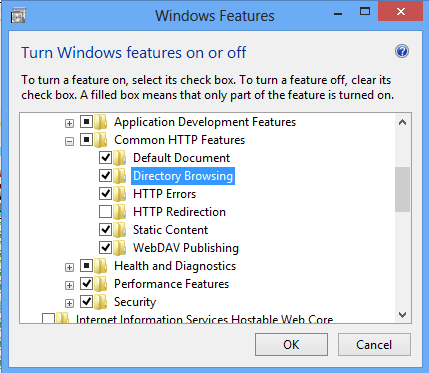 The <directoryBrowse> element is included in the default installation of IIS 7 and later. 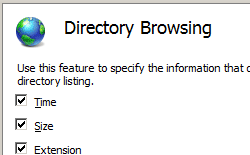 If directory browsing has been uninstalled, you can reinstall it using the following steps. On the Server Roles page, expand Web Server (IIS), expand Web Server, expand Common HTTP Features, and then select Directory Browsing. Click Next. Expand Internet Information Services, expand World Wide Web Services, expand Common HTTP Features, and then select Directory Browsing. 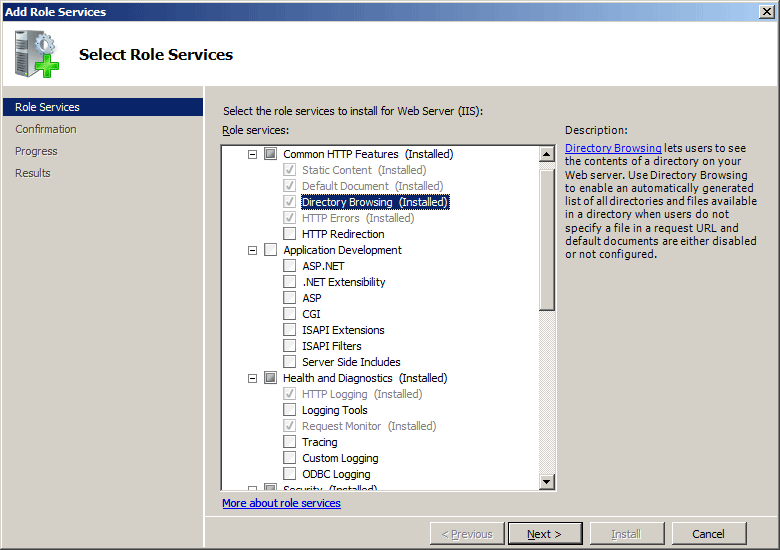 On the Select Role Services page of the Add Role Services Wizard, select Directory Browsing, and then click Next. Expand Internet Information Services, expand World Wide Web Services, then expand Common Http Features. 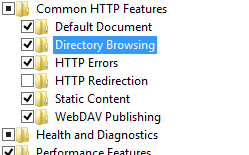 In the Connections pane, expand the server name, and then go to the site, application, or directory where you want to enable directory browsing. 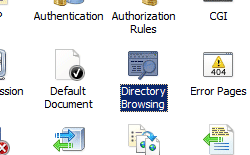 In the Home pane, double-click Directory Browsing. In the Directory Browsing pane, select the options that correspond to the information you want to display for each item in the directory, and then click Apply. The <directoryBrowse> element is configurable at the site level, application level, or directory level in the appropriate Web.config file. 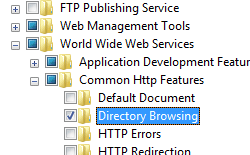 Specifies whether directory browsing is enabled (true) or disabled (false) on the Web server. The showFlags attribute can have one or more of the following possible values. If you specify more than one value, separate the values with a comma (,). The default values are Date, Time, Size, Extension. Includes the last modified date for a file or directory in a directory listing. Includes a file name extension for a file in a directory listing. Includes the last modified date in extended format for a file in a directory listing. Specifies that only the file or directory names are returned in a directory listing. Includes the file size for a file in a directory listing. Includes the last modified time for a file or directory in a directory listing. The following example enables directory browsing and uses the showFlags property to configure IIS to display the date and time modified for each item in the directory, along with each item's file size and file name extension. The following examples enable directory browsing for a site named Contoso and use the showFlags property to configure IIS to display the date and time modified for each item in the directory, along with each item's file size and file name extension. appcmd.exe set config "Contoso" -section:system.webServer/directoryBrowse /enabled:"True" /showFlags:"Date, Time, Size, Extension"
directoryBrowseSection("showFlags") = "Date, Time, Size, Extension"
directoryBrowseSection.Properties.Item("showFlags").Value = "Date, Time, Size, Extension"